Despite hosting the Cleveland Cavaliers at his new Pick 6IX Restaurant earlier this week, Drake is still a proud supporter of his hometown Toronto Raptors — and he's showing off that loyalty with a brand new basketball jersey. Drake's OVO merch line has teamed up with the Raps for a limited-edition jersey, which is currently available through both OVO and Real Sports. It arrives as the latest part of Nike's City Collection. In OVO's signature style, the mesh tank is black and gold. 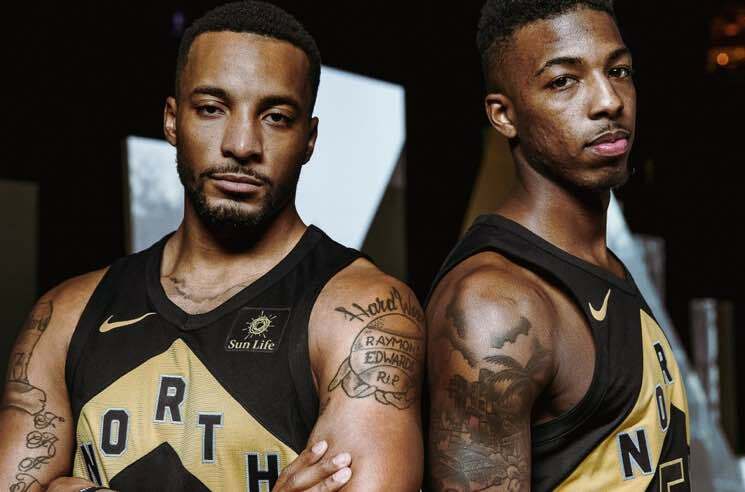 It's emblazoned with "NORTH" atop an upwards pointing chevron (with six points, representing the six boroughs of Toronto), as well as the names and numbers of star players like DeMar DeRozan, Kyle Lowry and Serge Ibaka. There's also other merch, like tank tops, hats, hoodies and toques, as well. Get a glimpse at some of the offerings below, and head over here to peruse the full collection. Drake's albums Views, If You're Reading This It's Too Late, Take Care and What a Time to Be Alive are available on vinyl through Umusic.